In our struggle to meet our growing energy demand while at the same time reducing global carbon emissions, Combined Heat & Power (CHP) is one option that can significantly move us in the right direction. Compared to a typical steam power plant, a CHP plant can provide about twice the energy for the same amount of CO2 emission. This is simply because the CHP plant utilizes the heat that the power plant throws away. The recovered heat can be used for heating water or heating or cooling homes, office building, malls, hospitals, factories and more. It can be applied anywhere in the world, yet today only about 5% of the power generated in the world comes from CHP plants, located mainly in northern Europe. So finding ways to expand the use of CHP plants is a big step in the right direction. CHP is a local solution with the plant built near the factory, hospital, village, town or city which it serves. Each application has its own unique set of conditions (heat and power loads, climate, etc.) 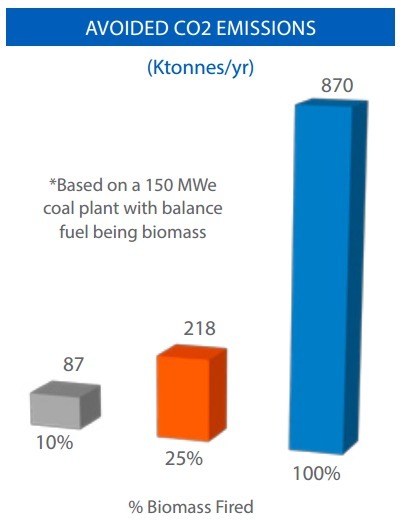 with fuel availability being the most important financial factor for the CHP plant. We have supplied hundreds of CFB and BFB Boilers in CHP applications which take full advantage of locally available fuels and diversified fuel mixes such as locally mined coal, coal slurry, forest and agro-biomass, refuse derived fuels (RDF), biosludges, MSW and other local wastes resulting in affordable and secure power and heat with the lowest environmental impact. Biofuels include natural materials and waste produced by industrial or other processes.